Style sheets are disabled or not working. dustygroove.com requires style sheets to function correctly. 100s of new titles added daily! This image is a general representation of the item and the actual product may differ slightly in terms of color shading, logo placement, borders, or other small details. Used items may have various cosmetic differences as well. Customers who are signed in and have open orders may add items to their order for combine shipping and faster checkout. This reserves the item sooner, securing your place in line — which is great when ordering hard-to-find items! to add this item to your open order. Tremendous work from saxophonist Paul Gonsalves – one of his rare UK sessions from the 60s, all of which show that he had a fantastic sound that went way beyond his more famous work with Duke Ellington! The style here is tight, hip, and very grooving – work by a quartet that features Gonsalves on tenor, plus Pat Smythe on piano, Kenny Napper on bass, and Ronnie Stevenson on drums – all hitting a soulful hardbop style that's very much like the best Tubby Hayes records from the time! 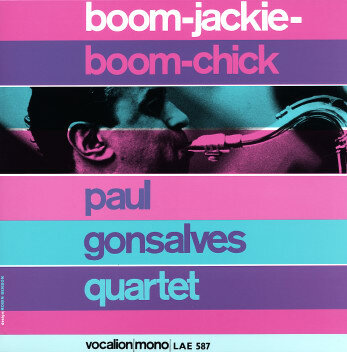 Gonsalves' tone is incredible – with that raspy, almost flatted mode that he used with Ellington – and it really stretches out here with plenty of room for creativity, in a way that makes us wonder why nobody ever got this one issued over on our side of the Atlantic. Titles include "Boom Jackie Boom Chick", "Village Blues", "Poor Butterfly", "Blue PG", and "Taboo". © 1996-2019, Dusty Groove, Inc.
We realize that there are many different interpretations of the standard grades used for pre-owned vinyl record albums & CD, so we thought we'd offer you the ones that we are working with, so you have an idea what we mean when we give the grade for a non-new item on our pages. Below are stated conditions for a used vinyl records at Dusty Groove. Grading for the cover should be assumed to be near (within a "+" or "-") the grading for the vinyl. If there is significant divergence from the condition of the vinyl, or specific flaws, these will be noted in the comments section of the item. However, please be aware that since the emphasis of this site is towards the music listener, our main concern is with the vinyl of any used item we sell. Additionally, all of our records are graded visually; considering the volume of used vinyl we handle, it is impossible for us to listen to each record. If we spot any significant flaws, we make every attempt to listen through them and note how they play. This is what it says, that the record is still held fast in shrink-wrap. We tend to be pretty suspicious about these things, so if the shrink-wrap doesn't look original, or if the record seems to have undergone some damage over time, we'll probably take it out of the wrapper to ensure that it's in good shape — which is why we don't have more of these. In some cases the shrink-wrap may be torn in spots, but if it's not possible the record has been taken out and played, the record will still qualify as "Sealed". Dusty Groove does not use the grades of Near Mint (or Mint, for that matter) because in our experience, we find that no records ever qualify for such a high grade. Even sealed records tend to have one or two slight faults, enough to usually qualify them for a grade of NM- or lower. We've often found that records which are clearly unplayed will have a slight amount of surface noise, especially in quieter recordings. Black vinyl that may show a slight amount of dust or dirt. Should still be very shiny under a light, even with slight amount of dust on surface. One or two small marks that would make an otherwise near perfect record slightly less so. These marks cannot be too deep, and should only be surface marks that won't affect play, but might detract from the looks. May have some slight marks from aging of the paper sleeve on the vinyl. Possible minor surface noise when played. Vinyl should be very clean, but can have less luster than near mint. Should still shine under a light, but one or two marks may show up when tilted. Can have a few small marks that may show up easily, but which do not affect play at all. Most marks of this quality will disappear when the record is tilted, and will not be felt with the back of a fingernail. This is the kind of record that will play "near mint", but which will have some signs of use (although not major ones). May have slight surface noise when played. Vinyl can have some dirt, but nothing major. May not shine under light, but should still be pretty clean, and not too dirty. May have a number of marks (5 to 10 at most), and obvious signs of play, but never a big cluster of them, or any major mark that would be very deep. Most marks should still not click under a fingernail. May not look near perfect, but should play fairly well, with slight surface noise, and the occasional click in part of a song, but never throughout a whole song or more. This is clearly a copy that was played by someone a number of times, but which could also be a good "play copy" for someone new. Vinyl may be dirty, and can lack a fair amount of luster. Vinyl can have a number of marks, either in clusters or smaller amounts, but deeper. This is the kind of record that you'd buy to play, but not because it looked that great. Still, the flaws should be mostly cosmetic, with nothing too deep that would ruin the overall record. Examples include a record that has been kept for a while in a cover without the paper sleeve, or heavily played by a previous owner and has some marks across the surface. The record should play okay, though probably with surface noise. Vinyl may be dirty, or have one outstanding flaw, such as a light residue, which could be difficult to clean. May have marks on all parts, too many to qualify as Very Good-, or several deeper marks, but the record should still be ok for play without skips. In general, this is a record that was played a fair amount, and handled without care. A typical example may be a record which has been heavily played by a DJ, and carries marks from slip cueing. Depending on the quality of the vinyl, may play with surface noise throughout. A record that you'd buy to play, cheap, but which you wouldn't buy for collecting. Will have marks across all parts of the playing surface, and will most likely play with surface noise throughout. May have some other significant flaws, such as residue, or a track that skips. In most cases, a poor quality copy of a very difficult to find record. This is a grade we rarely use, as we try not to sell records in very bad condition, though in some rare cases we will list a record in such bad shape that it does not conform to the standards above. A "Fair" record will have enough marks or significant flaws that it does not even qualify as "Good", but is a copy you might consider for playing, if you're willing to put up with noise and/or flaws. An example might be a recording with surface noise so heavy that it is equal to the volume of the music. For records listed as "Fair", we will describe the extent of the condition in the comments. Like "Fair", we rarely list records in this condition, as they represent the extreme low end of spectrum. These records typically have multiple serious problems, and we offer them as "relics" or "objects" only — for those who want to at least have a copy of a record, even if it is not really worthy of play, perhaps for the cover alone. For these records, we will describe the extent of the condition in the comments. If something is noteworthy, we try to note it in the comments — especially if it is an oddity that is the only wrong thing about the record. This might include, but isn't limited to, warped records, tracks that skip, cover damage or wear as noted above, or strictly cosmetic flaws. We have only one grade for non-new CDs at Dusty Groove — "Used CD". This grade is somewhat all-encompassing, but we choose it because we try to offer Used CDs in the best shape possible. All of our Used CDs are guaranteed to play without skipping or flaws. If you purchase a Used CD from Dusty Groove, you have 1 week to play it to determine that it plays correctly — and if it does not, then you may return it for a full refund. With our Used CDs, you can expect the disc to be free of all but the lightest of surface marks — clean, and not dirty at all. You can also expect the case to be clean (we often change the cases ourselves — putting fresh cases on Used CDs we handle) — and you can expect the booklet to be in good shape, unless noted otherwise. We will list any specific details/defects underneath the item — so look for notes on cutout marks in the case, stamps on the barcode, or details like that. Dusty Groove is a registered trademark — read more.